I am so far behind most of you with the decorating. I did make a tiny start, the front door pocket. 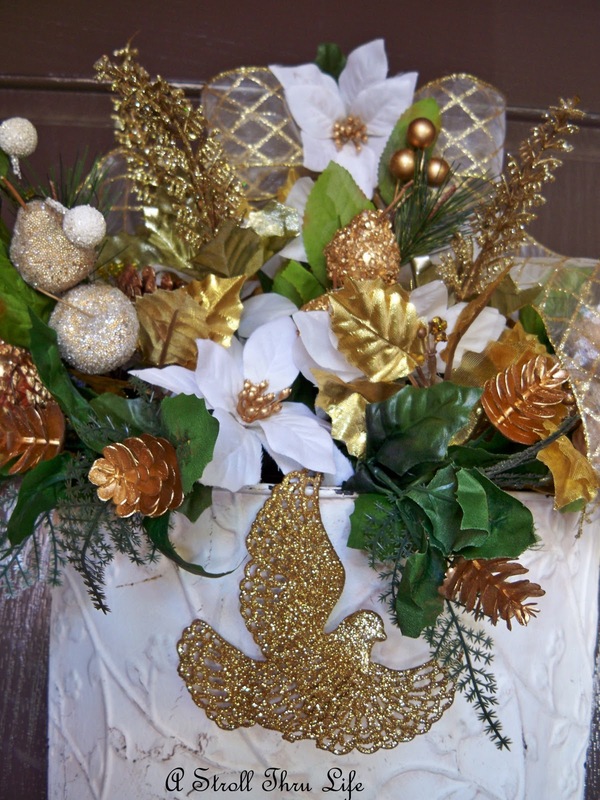 I think I will do all the outside in white and gold this year, since the inside is always traditional red and green. Just a few things that I picked up at the Dollar Tree and my GW door pocket. The little Dove ornamnet is perfect to hang off the front. The reason I am so far behind is this - A Pumpkin Pie. We had Thanksgiving with friends and today we are having our family Thanksgiving. So, I am knee deep in Turkey, Dressing, Mashed Potatoes, Candied Yams, Green Bean Casserole, Cranberry Sause, Gravy and homemade Rolls. Throw in a Chocolate Meringue Pie and we are all set. See you all tomorrow afternoon for Table Top Tuesday. Have a super Sunday!!! 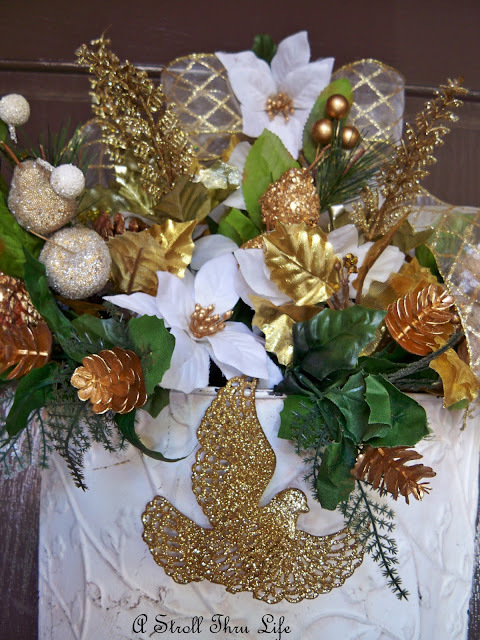 Looks yummy at your house -- can't decorate for Christmas until you get finished with Thanksgiving! Your door looks beautiful -- can't wait to see the rest. Marty, I am just now starting, too. It will take days and then I have to clean up the mess. Enjoy your meal. I'm way behind too, Marty! Oh, those pies look yummy. You are so creative with the door basket! I love it! I'm fully decorated with everything I own. Everyone's blogs are beautiful! hahaha o poor you, so much work, but the pies look so gorgeous- wish I could come by and have a bite !! Hi Marty, Your door looks so pretty! The pies look so delish! !Have a great dinner. I just drug out the boxes to decor yesterday but haven't had a minute to do a thing. Love your little door pocket...I too have a GW tin pocket I have to decorate with my DS filler...we think a lot alike! So much to do...so little time. I started grabbing boxes full of Christmas decos last week-end. Knowing that my cousins and their halvs are coming, a tradition we have for quite awhile. Hope you enjoyed your moment together with your good friends. Have a great week ahea. The pocket with gold and white turned out very pretty. I have a green thrifted pocket and you have inspired me to go forth and decorate. You're not any farther behind than I am. Ugh! We do have our tree partically up, at least. I love your door pocket! I need to get crackin' on my door. Hi Marty, We just put up the tree today and it is not even finished yet! I haven't started decorating the rest of the house except to make cloches for your party. Your door arrangement is lovely. Enjoy your 2nd Thanksgiving! The pie looks yummy and don't worry about being behind. You are not behind:) Come to my house! LOL! Your not behind Marty. It's just in bloggy land where we think we're behind. hehe. 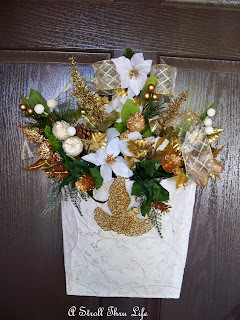 I love the pocket decor for your door, how pretty is that! And those pies, oh my, hungry is the word now! How delicious Marty. I would love the recipe for the chocolate one! And you are NOT behind. I just think the rest of them are over achievers. Not me.... I don't have 1 decoration up yet! No pressure Marty! Really it all gets done in the end, and then we have to put it all away before you know it. Love your new door decor, very pretty. 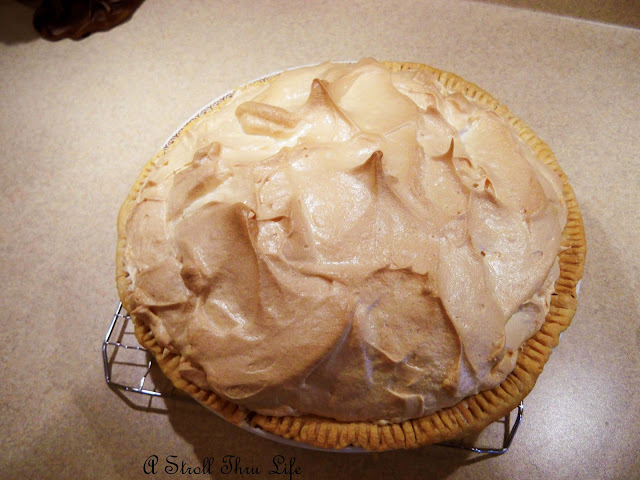 Did you say chocolate meringue pie? The heck with the decorations! Um, those pies are mouth watering!! 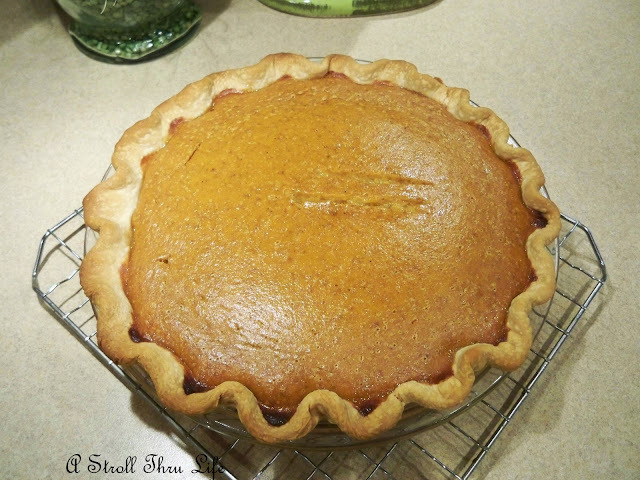 Your pie pics made me hungry for Thanksgiving all over again. Good luck with all your decorating. See ya Tuesday at TTT. Your front door piece is beautiful. Love all the gold colors. The pie looks soooo delish !! I am behind too , just had too many other things going on ! Love the metal pocket ! I have one just like it !!! Have fun decorating ! Far behind. . .don't stress, dear friend! This is the Season to savor all the preparation we've been planning throughout the year! The pie looks yummy! You are not as far behind as I am. For many years I have had the tree up and decorated before Thanksgiving as the Grands loved having it up when they came for Thanksgiving, but it did not happen this year! Have cut back a lot this year. I love your door pocket arrangement. I have two that I picked up while thrifting over the last couple of months. Both need to be repainted and have something fun done with them. You've inspired me to get them done. Right away! I, too, feel that I'm behind in my Christmas decorating plans. We had new carpet installed a little over a week ago and over Thanksgiving weekend we had three grandkids come - one at a time - for overnight and a day with us. Now it's onward and upward! At least that's the plan! Your pies look so scrumptious, wish you had brought me a piece when you came calling yesterday! Have a wonderful week, my dear. The front door looks great! I really like the gold & white. By-the-way, what time is coffee & pie? I think that you are off to a beautiful start!! Your hanging wall basket looks very pretty! I like the gold and white. Have a wonderful day and I hope you enjoyed your Thanksgiving!